The all new Audi A8. It is truly all new this time. Not just new leds and a face lift, but an amazing high-tech vehicle, with a range of new engines, an extravagant new interior and an equally dashing exterior. 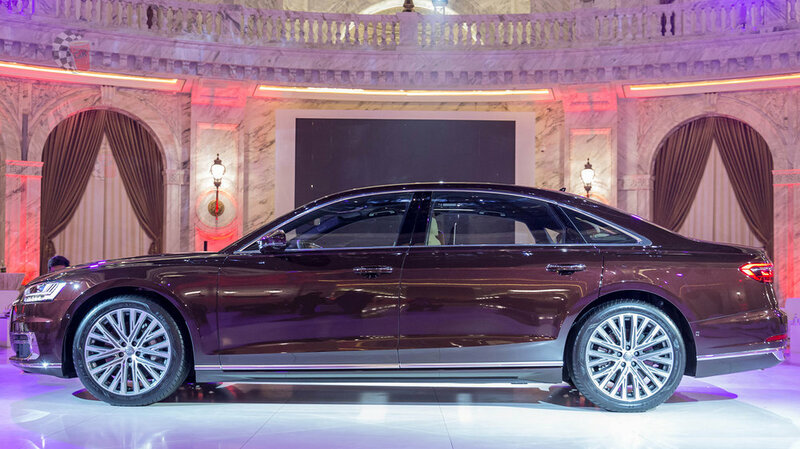 #AUDIQATAR revealed the Audi A8 at al-hazem mall. one of Qatar's most luxurious destinations. Audi qatar is first AUDI dealership in the Middle East to release their all new flagship. Let me start with WOW! I love how Audi always takes their LED game to the next level. Let us not forget that Audi was the first to put LEDs on their vehicles. Then everyone else started to follow. YES, Audi A8 was the first car to roll out with LED lights, follow by Lexus. Now with this new forward facing HD Matrix LED headlight, the camera recognizes oncoming traffic and informs the system which then makes fine adjustments, voiding out light cones that shine directly towards opposing vehicles. Complimenting the front end is the all new back OLED lights. When the Audi A8 is unlocked or locked, the available OLED taillight animation sequence activates with two parallel loops stretching horizontally across the trunk lid. Long story short, the exteriors all new shaved up corners, silk design; a heritage from this flagship, the new symmetrical grill with the new lights and the overall shape of the car just give it a majestic presence on the road. Well one thing for sure is that Audi didn't hold back. Pick any seat and you'll find yourself engulfed in a luxury cocoon of leather and elegant aluminum trims. It is an amazing place to be with the ambient smooth mode lights which add a touch of color to the available interior lighting options that create an atmosphere to match your current mood or an outfit. Smooth comfortable hugging seats, a mix of sportiness and luxury and leather is not only on the seats but rather extends through out the car, the steering wheel, the gear leaver and the arm rest ensure the driver and passengers an unforgettable ride in complete luxury and comfort. The new tech inside the car is limitless. Behind the wheel of your Audi, a commanding focal point — aside from the road — is the available Audi virtual cockpit. Positioned within your line of sight, this intuitive digital display provides traditional and customizable on-demand information when and where it’s needed, helping to improve the way you interact with your vehicle and the road ahead. Enter commands using the multifunction steering wheel and switch between display modes with the ‘View’ button. Centered on the dash is a 10.1-inch haptic-feedback touchscreen that acknowledges inputs with a pulse when tapped. Below that on the center stack is a second screen, which functions primarily to display HVAC controls but can be used for other operations, including Google or navigation searches via handwriting recognition. The move to haptics eliminates most buttons as well as nearly every knob from the A8’s cockpit; a lone volume knob remains. But the system is highly configurable, allowing owners to choose their own dedicated buttons on the lower screen while offering permanent buttons for navigation, weather, telephone functions, and radio on the left side of the upper screen. Well there will be a W12 in the future avaliable but for now you can get your hands on the 3.0-liter turbo V6 with around 335 hp and 325 lb-ft of torque and an optional 4.0-liter twin-turbo V-8 with around 453 hp and 444 lb-ft. Both engines will be paired to an eight-speed automatic transmission. As comfort is the biggest deal for us, the 2019 Audi A8 comes with an optional Audi Intelligence (AI) active suspension, one component of a suite of intelligent features. It includes an electric motor at each corner capable of raising or lowering that wheel via a torsion bar linked to the suspension. The AI system scans the road ahead with a forward-looking camera and turns that data into wheel motions that follow the road’s shape.